The President of the Republic, Mr Danny Faure, received a delegation from Turkey led by the Member of Parliament and Chairman of Turkey-Seychelles Inter-parliamentary Friendship Group, Hon Bekir Kuvvet Erim, at State House this morning. President Faure welcomed the delegation to State House and expressed Seychelles’ willingness to further develop cooperation ties between Seychelles and Turkey. “Seychelles and Turkey share a very active and dynamic cooperation agenda. Turkey has been instrumental to our socio-economic progress including the reinforcing of our human resources and financing of certain important projects. I am happy to see representation of various sectors in your delegation today and I hope you have fruitful discussions during your stay in Seychelles,” said President Faure. The delegation discussed establishing cooperation links and partnerships in sectors such as tourism, trade, investment, health, and renewable energy. 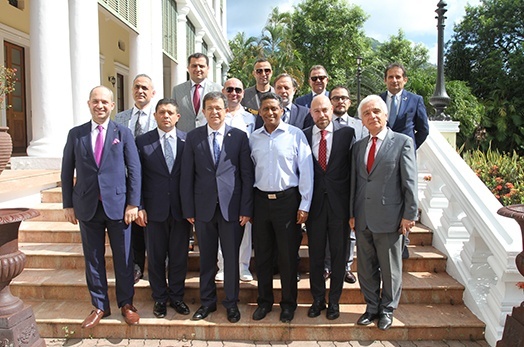 Members of the Turkish delegation included the Turkish Ambassador to Seychelles, H.E Ambassador Ahmet Cemil Miroğlu, Armed Forces and Naval Attaché of the Turkish Embassy in Nairobi accredited to the Republic of Seychelles, Captain (Navy) Mehmet Alp Silivri, the Chairman of Turkey-Seychelles Business Council, Mr Süleyman Boşça, the Vice-Coordinator Chairperson of Turkey-Africa Business Council, Mr Yalçin Kiroğlu, the CEO of Sila Consulting, Health and Construction Trade, Mr İhsan Şahin, Karpowership, Board of Directors Advisor, Amb. (Rtd) Mr Şander Gürbüz, Chairman, Ağaoğlu Textile Industry, Mr İsmail Ağaoğlu, and the CEO of Hex Investment, Mr Hakan Cetin. The delegation is expected to participate in various discussions and meetings with the opportunity to engage with their Seychelles counterparts. Seychelles and Turkey established diplomatic ties on 22 June 1995.